The gun in the photos below is a Percussion Over/Under Rifle/Shotgun (.40 Caliber/20 Gauge) with full octagonal 30" barrels, dual ramrods, double triggers, and back action locks. It has a Tiger Maple stock having a straight comb cheek piece and silver furniture and inlays. The locks, hammers, and screws are engraved. 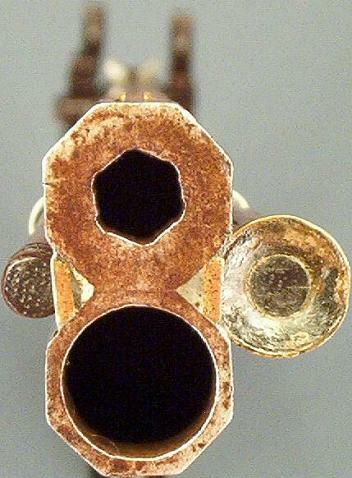 The top of the top barrel is inscribed "Wm. 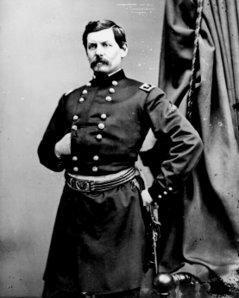 McClellan". 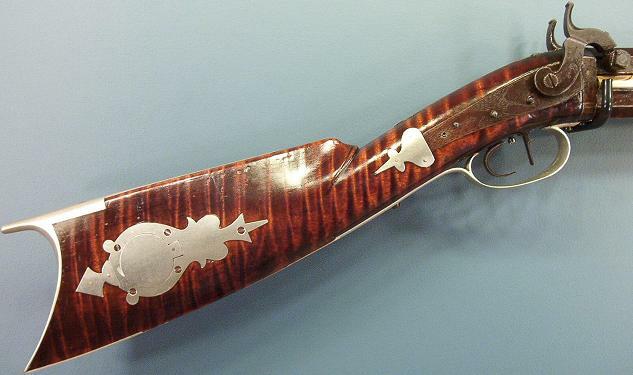 This gun is from Clarence Cathers' Collection. This gun was purchased because it is a Percussion Over/Under Rifle/Shotgun and includes a silver patchbox. 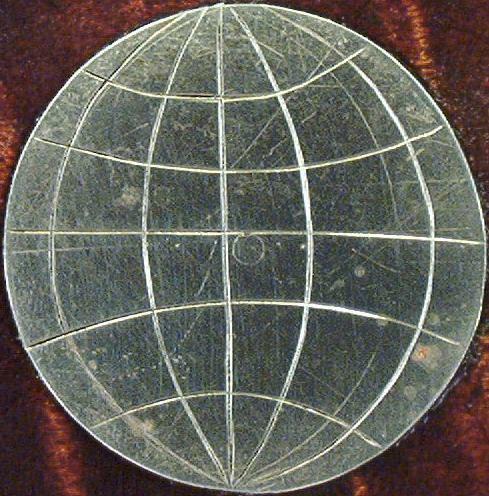 The author was willing to pay a premium for this gun because it has a silver inlay of a Lambert Map Projection of a globe with lines of latitude and longitude given; similar to the Orthographic Map Projection in the TDB Consulting logo. 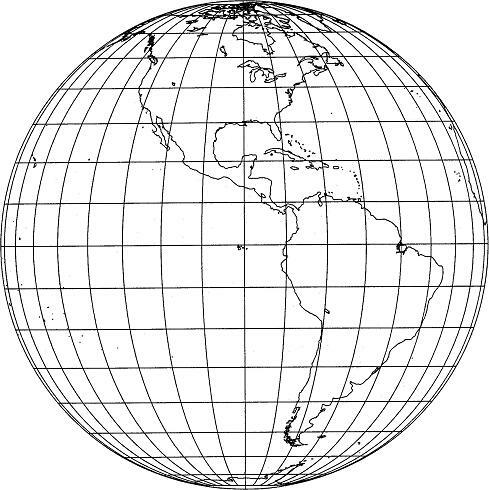 A Lambert and Orthographic Map Projection are given below. 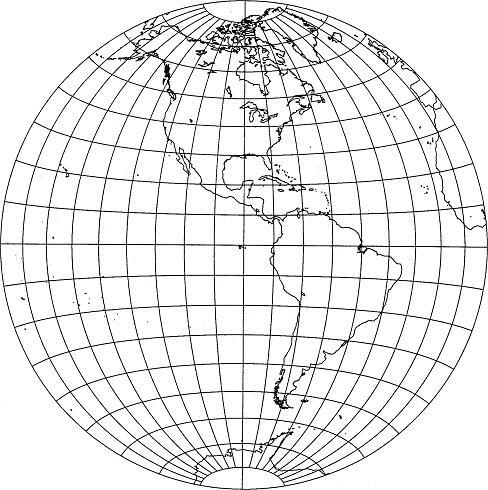 Notice the difference between these two Map Projections. Could the Captain William A. McClellan in the photo above be the same individual who made or owned this gun? Capt. McClellan is of Scotch ancestry. His great-grandfather, Benjamin McClellan, was a native of Scotland, and having emigrated to America, at an early day, became one of the primitive settlers at Georgetown, Ky. William McClellan, son of Benjamin, and a native Kentuckian, was born in 1780. Growing to maturity, he married Miss Katie Criswell, and in 1816, after the birth of three children, they moved to Greene County, Ohio. Here he settled upon land adjacent to the present town of Cedarville, and in a recent history of Greene County, he is mentioned as having been the first school-teacher in the then hamlet of Xenia. He boarded and lodged at home, while his school was eight miles distant, and he walked this distance, twice each day, carrying his rifle with him as a defense against the Indians and wild animals. He died in 1863, at the age of eighty-three years. His son James was the father of our subject. He was born in Greene County, Ohio, December 5, 1817, and enjoyed the advantages of a good primary education at the hands of his father, who was an educated man. In addition, he enjoyed the privileges of the common schools, when not engaged with his father upon the farm. In 1836, he married Miss Harriet Beemer, and within a short time thereafter, engaged with his father-in-law, Frederick Beemer, in a saw-mill at Cedarville, Ohio. He was thus engaged until February, 1849, at which time he came, with his family, to Delaware County, Ind. 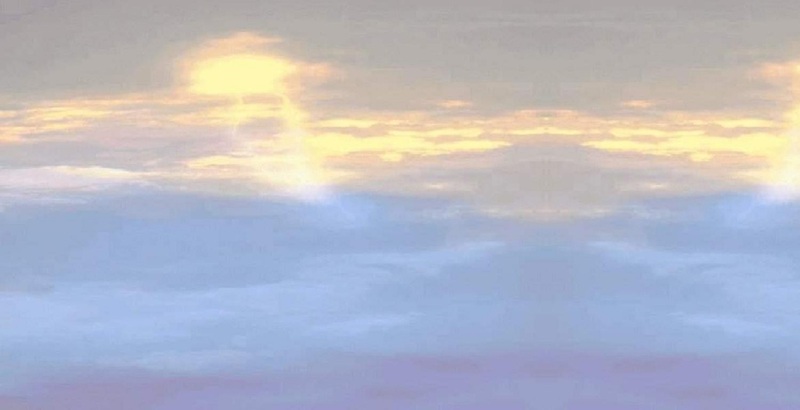 Following his arrival, he located upon the farm, where he still resides, in the northwest portion of Center Township. For a period of thirty-two years, he has been a faithful tiller of the soil in Delaware County, and has been highly respected as a citizen of integrity. He has reared a family of nine children, who have honored him by taking their place, severally, among the best citizens of the county. His children were William A., Frederick H., John F., James M., McHenry A., Julia F., George E., Charles A. and Katie B., all of whom now reside in this county excepting Frederick H. and Katie B., who are deceased. William A., the oldest son, and the subject of this biography, was born June 27, 1837, at Cedarville, Greene Co., Ohio, and accompanied his parents to Delaware County, Ind., in 1849. He enjoyed the advantages of a good English education, and continued to assist his father about the farm until the spring of 1859. He then engaged as a clerk in the grocery store of his uncle, G. Beemer, at Muncie,and remained in his employ until August, 1862. The exigencies of the times demanding patriotic services, he abandoned his position and assisted in recruiting Company D, of the Eighty-fourth Regiment Indiana Volunteers. He was commissioned Second Lieutenant of this company August 14, 1862, and promoted to the position of First Lieutenant on the 6th of January, 1868. On the 28th day of February, 1865, he was again promoted to the rank of Captain, and was finally mustered out with his regiment on the 14th of June, 1865. He was with his regiment, principally, during its eventful and gallant career, and acted a soldierly part throughout the war. Returning from the army, he resumed his position as clerk in his uncle's store, remaining thus engaged up to December, 1868. He then withdrew to occupy his present farm of 168 acres, in Hamilton Township. This land he had purchased in the spring of 1865, prior to the close of his military life, but did not build his residence until the fall of 1868, just previous to his occupying the same. He was married on the 1st day of July, 1868, to Miss Lydia A. Blackford, of Delaware County. Five children have come to bless this union--Harry J., born January 31, 1862; Ney, born February 17, 1866; Wilbert E., born August 24, 1873; Bessie Katie, born October 8, 1875, and Robert H., born September 16, 1879. Capt. McClellan is a man of sterling qualities; one who, by his upright life, genial, and hospitable nature, and a force of character, has won may warm personal friends and admirers. 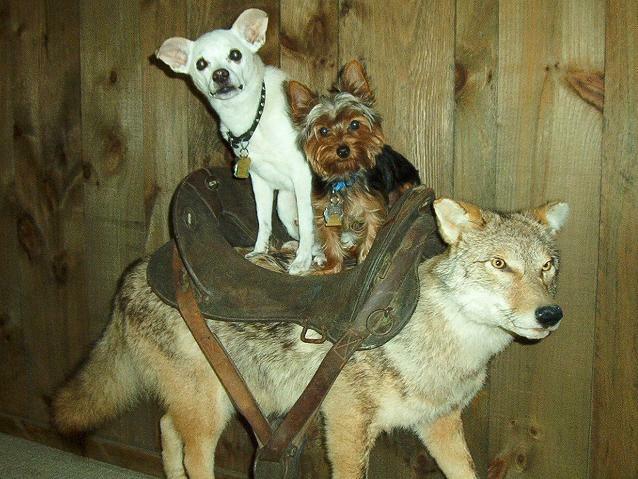 In politics, he acts with the Democratic party. In the progress of public improvements, and in the interests of public schools, he bestows an approving influence. Aside from the management of his farm, he is extensively employed by the county in the locating and construction of ditches and gravel roads. He is, indeed, an honored and respected citizen. Could the Captain William A. McClellan described above be the same individual who carried this gun? He married Almira McClellan. Mrs. Roberts was born in Guernsey County, Ohio, November 26, 1850. Her father, William McClellan, was born in Greene County, Pennsylvania, in 1820 and died in Guernsey County, Ohio, in 1892. After being reared to manhood in his native county he removed to Guernsey County, was married there, and followed his trade as gunsmith for many years. He was a democrat and an active supporter of the Christian Church. 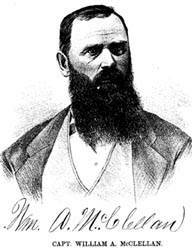 William McClellan married Jane Ray, who was born near Wheeling in what is now the State of West Virginia in 1826, a daughter of Edward Ray, who was brought from Ireland when two years of age and spent most of his life as a pioneer farmer in Guernsey County, Ohio. Mrs. William McClellan died at Cromwell, Indiana, in 1875. Her children were: Martha J., deceased; Mrs. James Roberts; Mrs. Ella Ramsey who lives at Columbus, Ohio, Eva, deceased, and James C., a farmer near Fredericktown, Missouri. 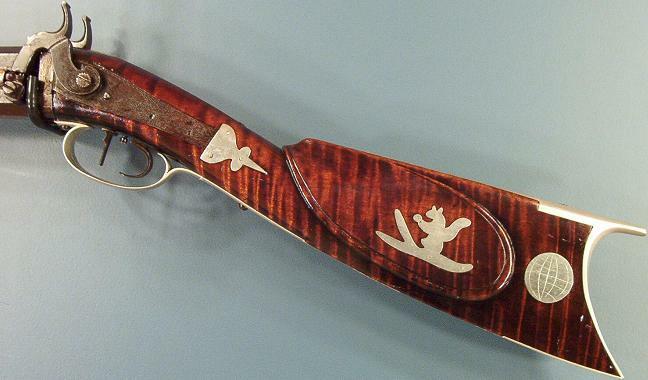 Could the William McClellan described above be the same gunsmith who made this gun? This gun was made and/or owned by Wm McClellan.